Tired of your friends stealing your favorite spork? Now claim your color and your spork. The Snow Peak Titanium spork is the ultimate light titanium cutlery. This ultra-light piece of cutlery can be used as both a fork and a spoon. A hole in the handle is convenient for various uses. This is a piece of cutlery that is perfect for all types of food. 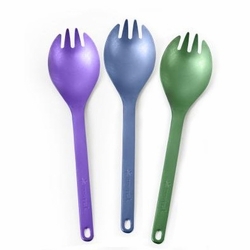 Fork Capability: The four claws at the tip of the spork can be used as a fork. Knife Capability: You can cut soft food using the curved side. Dimensions: L 6.5" W 1.6"